While I can understand the caution with remote viewing (thinking about its use in the wrong hands so to speak), I do believe there is sufficient evidence for this psychic phenomenon. In fact, it is a paranormal technique that was extensively studied and used in the US military’s Stargate Project in the 1980s, for example. 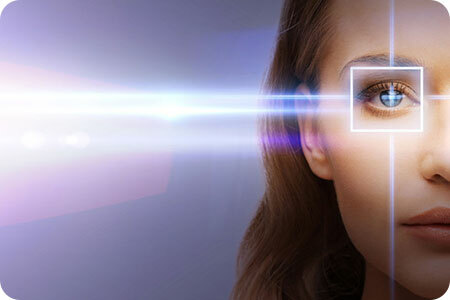 According to Wikipedia, “Remote viewing is the practice of seeking impressions about a distant or unseen target, purportedly using extrasensory perception or “sensing” with the mind.” Again, I can see why some people are actually a little scared or uneasy with the concept of remote viewing. I don’t want people spying on me either, but I feel remote viewing certainly also has benefits. I like to think about its practical applications. I have found it to be a very useful tool in finding lost objects! One of the most common and easiest to use magical divination tools might already be available in your toolkit, or perhaps your jewelry box. 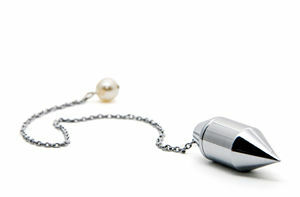 The pendulum is simply a weighted object attached to a chain or piece of string. Pendulums can be purchased, or made by hand. For best results, choose an object with a bit of weight. 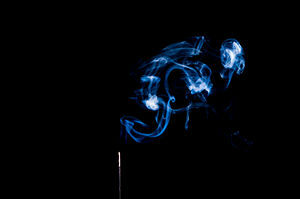 This type of magic is a dowsing spell. 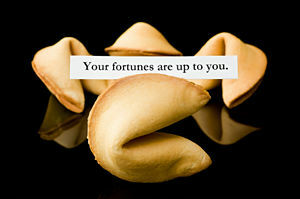 It will work best when your mind is at ease, since it is channeled through your subconscious. 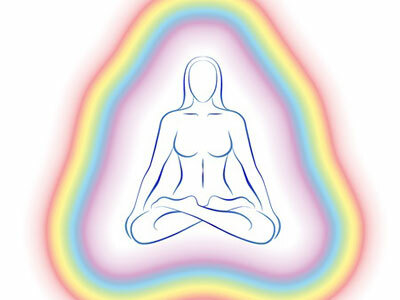 When I do psychic readings I use a variety of tools, such as crystals, pendulums, oracle cards and Tarot cards. In addition to my innate psychic and telepathic abilities, I use tools through which Spirit speaks. I typically use more than one tool in a reading and lately I’ve been favoring the pendulum with remarkably detailed and accurate results. We must all seem like such a stuffy and spoiled bunch lounging about with our standard tools such Tarot cards, imported crystals, and rune stones. These are so mainstream that it is almost acceptable to have them in every household. If in fact if we would be given the opportunity to get to know our clients and work with them with other methods of divination, they would be able to get even more detailed readings from some of us in our off-hours. I was thirteen years old, and out walking with my father when he said, “I want to talk to you about something”. I thought, “Oh no, is this going to be a talk about the birds and the bees!” And then he began, not a talk about the facts of life, but a little chat about what he called ‘The Spooks’. My dad spoke about his conversion from atheist to spiritualist some ten years earlier. He told me how my mother had taken a bet with him and he lost. Losing meant he would have to accompany her to a spiritualist church in London. He went to the spiritualist church one Sunday night when Joseph Benjamin, a well-known medium, was on the platform. I use a regular deck of playing cards and a pendulum as divination tools. 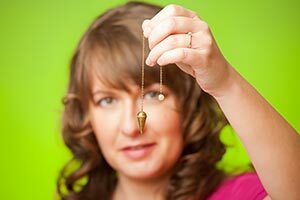 A pendulum is a weighted object at the end of a string or chain and it can be used for both dowsing and divination. The ‘bob’ of the pendulum is usually a crystal, piece of metal or some other gemstone. Pendulums have different sizes and shapes and they come in many colors. 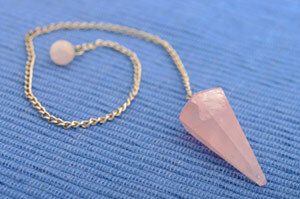 I use a quartz crystal pendulum with a 12 inch chain. Divination with a pendulum can be done in many different ways, including using charts. You can even use a simple chart you draw on a normal sheet of paper.